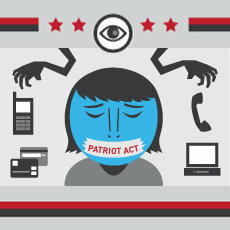 Sections 215 and 702 are essentially what allowed the NSA to implement the PRISM program. It revised the FISA to allow more surveillance. Both controversial sections of the bill are remarkably broad. With all of this in mind, here we are. We have Rand Paul standing for 10 hours fighting to stop the renewal, and a small number of people pushing for it to be renewed unchanged. I might raise the question, why is there now suddenly a frantic failure? Nothing was accomplished, and the Senate went home for a week. You’d swear they forgot the bill was set to expire until a few days ago. It’s a true failure of duty, and now they are on vacation! This bill affects all Americans, and the nerve required to come up with this last minute, hot and bothered attempt at either revision or reinstatement is astounding. In regards to both sides of the argument for and against the bill, I will quote Alexander Hamilton in the Federalist Papers: “The noble enthusiasm of liberty is apt to be infected with a spirit of narrow and illiberal distrust. On the other hand, it will be equally forgotten that the vigor of government is essential to the security of liberty; that, in the contemplation of a sound and well-informed judgment, their interest can never be separated.” How I wish for even an attempt at revision of the bill, and our senators are cozy in their homes. The task of amending the bill could hardly be given a deranged attempt before it expires on June 1st. Of course I’m sure the Senate was quite busy and they may, as I have said previously, have forgotten about this bill of utmost importance. Beyond all this nay-saying, it was found in a report by the US Department of Justice that the powers given to the FBI by the PATRIOT act have not helped solve any cases of terrorism. To those who blindly cling to this bill while it violates our rights to no avail, I say in the words of Samuel Johnson, Patriotism is the last refuge of a scoundrel.